Today marks the international celebration that is World Emoji Day. Fittingly, as a man with his finger on the pulse of the planet, Lewis Hamilton just launched his Hamoji sticker set. Designed to work with WhatsApp, iMessage, Snapchat and other popular social channels, this massive library of Hamilton expressions in sticker form are a must for any fan. 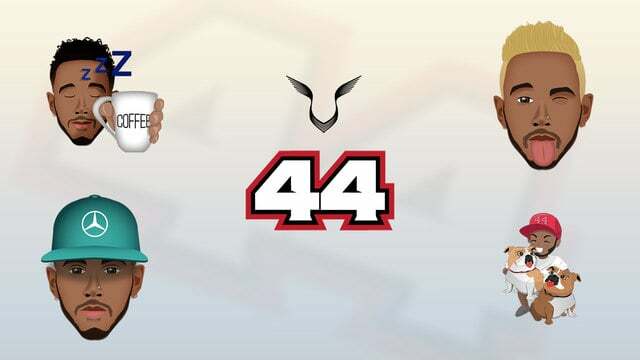 The custom emojis are all brilliantly drawn and feature a wide assortment of Hamliton references including hairstyles past and present, multiple designs of headgear, his own brand of energy drink, plus the dogs Roscoe and Coco. What's not to love! If there's a fault to be found, it's that looking through this selection of artwork alone you would have literally no clue what Lewis Hamilton actually does for a living. With the exception of his iconic #44 logo, there are zero references to Formula 1 to be found. Perhaps this is a result of F1's arcane licensing minefield, but could equally be a conscious choice to push "brand Hamilton" far beyond motorsport. Created in collaboration with CLIQ Moji, this launch represents F1's first proper foray into sticker sets. Although F1 has an official mobile app, the team behind it has thus far declined requests to provide Formula 1 inspired decals for the purpose of sharing. Fernando Alonso incidentally has also previously shared sticker packs, although those were only available in an older format. Hopefully he'll update those soon. We are already hopelessly addicted to sending crying-Lewis emoji's back and forth. Here's hoping more drivers and teams see the potential and follow Hamilton's lead. In the meantime do check out Lewis' sticker pack. Not for the first time he is showing everybody in F1 how it should be done.